The Effect of Vinyl Siding on the Appearance of Your House and How it Can Change Your Beautiful Neighborhood Into a Trailer Park. Is Using Vinyl Siding Saving the Forest? Your old house was originally designed for and built with wood shingles, wood clapboard, or both. Today, if you’re lucky, your house still has its original wood siding and has not been covered up with products such as Vinyl or Aluminum. For those of us that do have their original wood siding, if it doesn’t need to be painted now, it’s just a matter of time before it will need to be repainted again. Today, everywhere you look you see bright shiny vinyl – it looks so clean and makes a tired house look brand new – what to do? 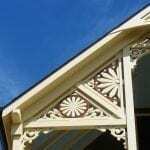 Remember, the goal of OldHouseGuy.com is to provide information to make the appearance of your house the best it can possibly be. Your house will stand out from the others in a class unsurpassed. 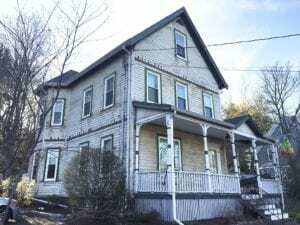 Whether you live in a small bungalow or Gothic mansion – you will be in the same group, a class far above those homeowners with plastic exteriors. If you have not read the Aesthetics page, please read it before proceeding. First, you need to reprogram yourself by really understanding the information provided on this site. Your thinking has been negatively influenced and altered over the years by living in a plastic environment, seeing vinyl siding everywhere you look and having this look reinforced by aggressive marketing. Today, we are all exposed to a flood of mailings and advertisements from contractors telling us how great our home will look with their Premium Vinyl Siding. 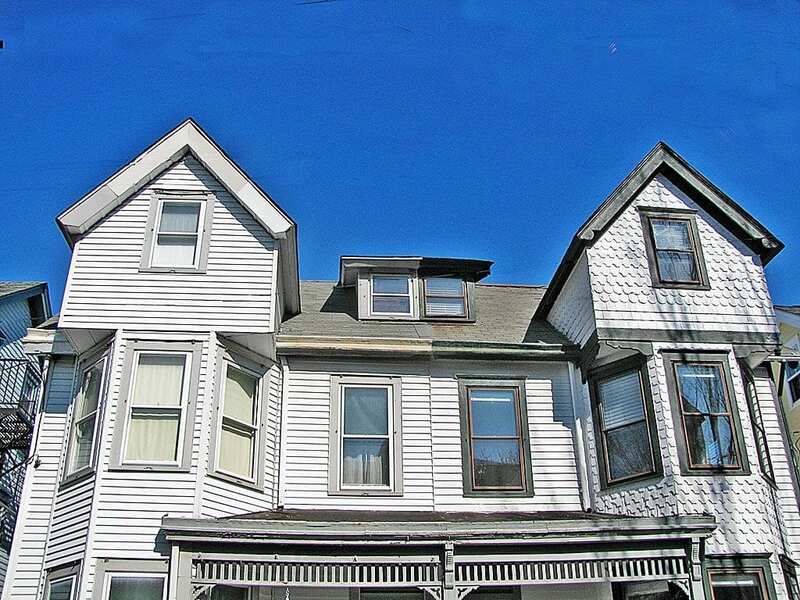 Their sales pitch stresses the beauty, low maintenance and wise investment of siding. Imagine how many people succumb to this marketing ploy. Even in historic neighborhoods, homeowners often consider modern siding for a variety of reasons. It’s important to the rest of us to convince them of their error. 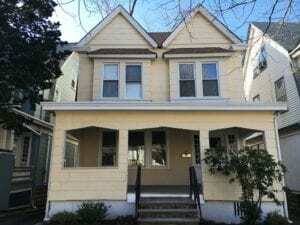 Why shouldn’t people use vinyl siding on an old home? 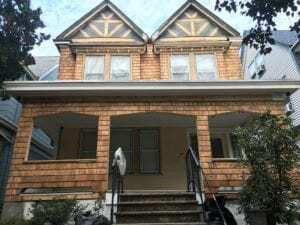 First of all, there is no doubt that a “siding job”, will totally wipe out the original character of an old house, not to mention the damaging effect it has on the appearance of the whole neighborhood. A neighborhood with vinyl sided homes is no more than a HIGH PRICED TRAILER PARK. Just because a house may be large and cost over a million dollars, does not mean that the owners have any class or taste. Your home is an extension of you. Wood has time-tested, timeless quality that does not go out of style. Remember that your house was originally designed based on architectural rules and principles as explained on the Aesthetics page. Each piece of wood is designed to work together and play off each other creating shadows and depth which creates an aesthetically pleasing building. Any alteration will result in a feeling of disharmony. Today, the pace of life is so fast, few take the time to really notice the harmony or disharmony of an old house. Once a house is covered with vinyl, it’s character is lost and is becomes a shiny bland box! “Vinyl siding creates a very different play of light and shadow on the wall surface, thus resulting in a different character. 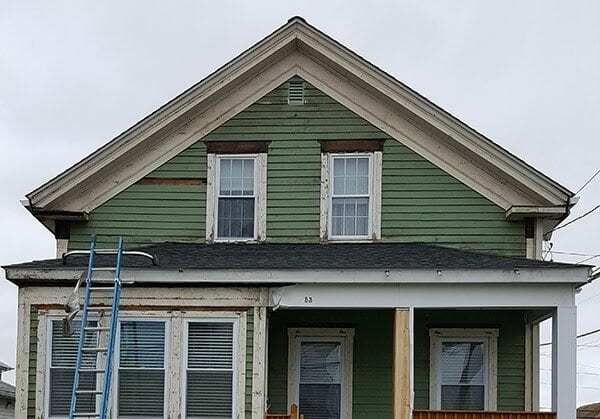 The width of the clapboards is altered, shadow reveals are reduced, and molding or trim is changed or removed in certain areas. 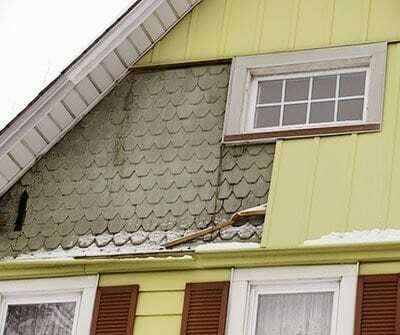 Because this siding is usually added on top of existing siding, details around windows and doors may appear set back from the siding rather than slightly projecting. To start, there are basically two ways to install plastic siding. The most common and least expensive way is to install it right on top of your current wood siding. When doing this, insulation is first installed over your original wood siding (giving you double the insulation value). The vinyl is then applied on top of this insulation. These extra layers or thickness brings the siding farther away from the house. The window casing is covered with a thin piece of vinyl which does not add proportional thickness. The result is that instead of the window casing being raised or even with the ends of the existing siding (Figure 1), the window casing is now recessed resulting in an entirely different look. A look that is not aesthetically pleasing and not in alignment with architectural principles (Figure 2). One positive note about this destructive method is that the original siding does not end up in the landfill. The siding is covered up waiting for someone in the future to remove the vinyl and restore the original wood. Damage incurred to other features during this process is another problem. 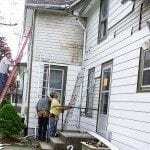 The other method of vinyl siding installation is to remove the original wood siding, insulate, and install. This will prevent the problem explained above, but there are still many other issues resulting in a negative appearance of your home. 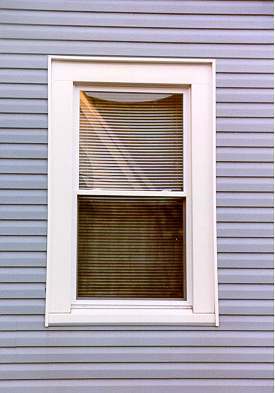 (Figure 1) Window with wood siding. 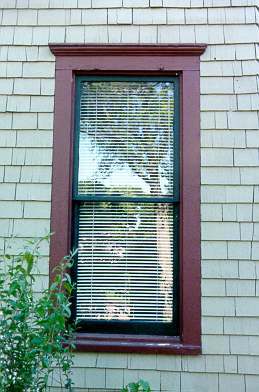 (Figure 2) Cheap looking window with vinyl siding. 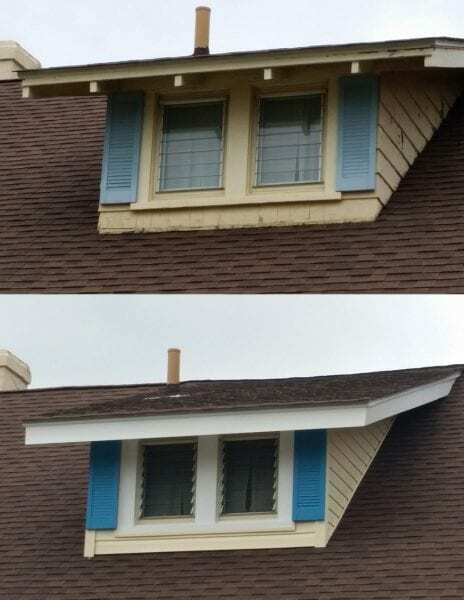 Since the vinyl siding is applied on top of the original wood in Figure 2, notice that the vinyl window casing is set back instead of slightly projecting. Also notice that the cornice has been removed. The sill and the cornice are elements that enable the window to appear more visually appealing while directing water to drip away from the building. To learn more about window design and problems you really need to be aware of, visit The Truth About Windows page. During both installation methods, decorative wood trim is almost always removed from the building. The cornice above the window casing veers out to the sides as in the picture (Figure 1). In a best case scenario, these corners are cut off and squared for ease of installation, but usually the entire piece is removed resulting in a bland window casing as in the picture (Figure 2). You do have an option to have this decorative piece replaced in vinyl. Beware, it will not look like your original. They are usually quite bulky – do not depend on the design knowledge of the person you hire. Another difference is the direction of the soffit boards. The boards used on a soffit are installed length-wise which accentuates the eaves or gable of the roof. With vinyl, the soffit is installed width-wise resulting in a different look. A look that the house was not designed to have. Installing vinyl siding on a building is like putting a slip cover on a sofa. It looks clean and new but the details – decorative seams, buttons or tacks, and individual cushions that create shadows are gone. 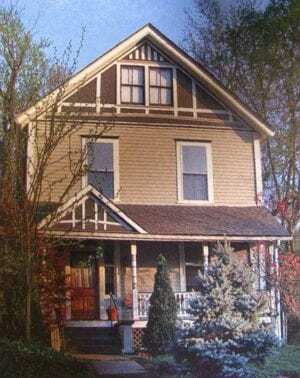 Once vinyl siding is installed, the effect of light and shadows and proportion is lost. Character is lost and the building is reduced into a featureless box of shiny plastic. A house is designed with features that work together and play off each other to achieve a building that is aesthetically balanced and pleasing. When one feature is altered, the others are affected. This may not be recognizable to you at first, but once your eyes are trained and you are aware of the influences of marketing, you will see. 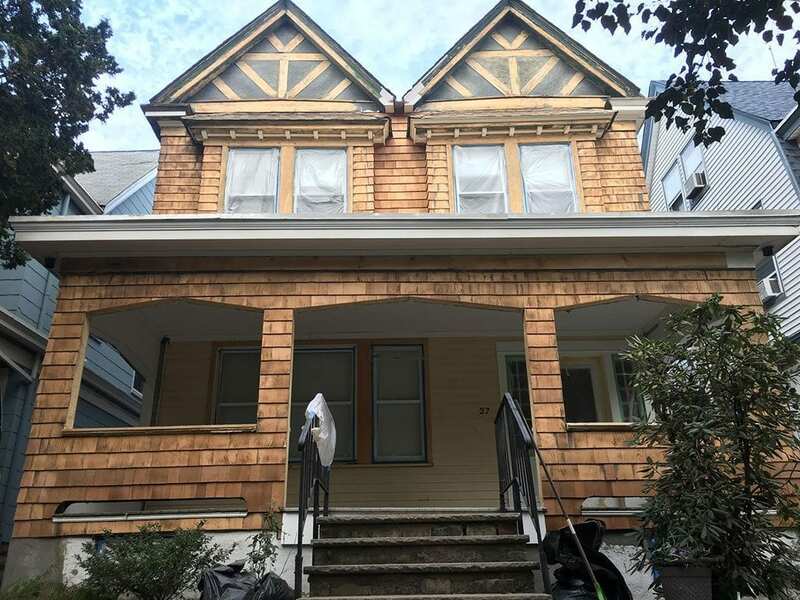 This duplex in Princeton NJ has one owner that appreciates having a nice house and wood siding and one owner from the wrong side of the tracks. Can you guess which side is which? This is a great way to compare and see the difference – so good that I just have to play it out more with close-ups below! Vinyl siding makes this house and the residents look cheap. Exterior wood siding makes this house look classic. Rafter tails hidden under vinyl siding. Man-made shingles/shakes on the top and wood shingles on the bottom. 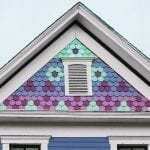 Although vinyl siding is most popular, vinyl shingles – vinyl shakes are also available. This house above has vinyl shingles on the top section and wood shingles on the lower portion. Notice how flat the vinyl shingles appear. The wood shingles, although in need of painting still provide better character to the home. The wood shingles are thicker for they produce a heavier shadow line. According to the National Fire Prevention Association, vinyl and aluminum siding create a fire hazard by keeping fire inside your house, intensifying the heat and literally turning your house into a furnace! It also creates serious problems for firefighters because it makes it difficult to locate the source of a wall fire. When vinyl siding burns, it releases toxic gasses and creates acidic smoke. The acidic smoke is so strong, it can kill a person inside the house before the flames or carbon monoxide. 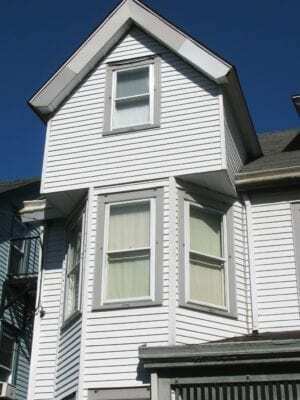 The following link contains more detailed information about the hazards of vinyl siding. Many people say: “There is still hope – once the owners pass on or move away, the new owners can remove the siding and expose the beauty and craftsmanship that lie underneath.” True, however there are features that have been removed and cannot be replaced as they were. I have seen a few houses where owners have removed vinyl, aluminum, or asbestos siding to reveal their original wood. Unfortunately, I didn’t have the opportunity to get photos before the siding was removed. Believe me the difference is stunning. I know of someone who removed asbestos siding on a 1838 house, only to find cedar shakes installed in the 1920’s. 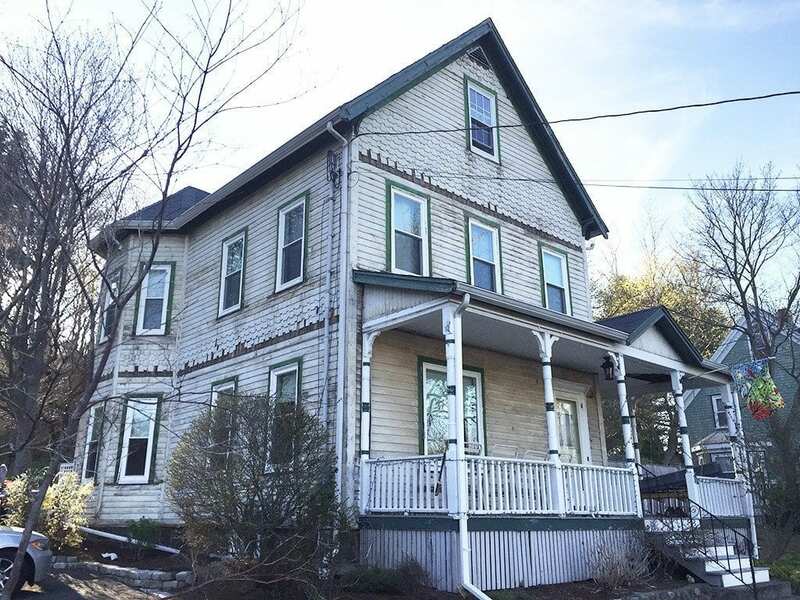 A year later, he removed the cedar shakes to expose the original 1838 clapboard. They were in great condition. He just needed to do some sanding and replace several clapboards. There were some nail holes that needed caulk – most were filled in by paint. 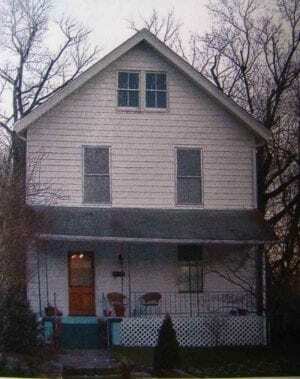 If you remove your siding, please send me before and after pictures (preferably in color). Removing vinyl siding. This house can now come back to life. The Old House Journal, July/August 2007, page 48 “Getting Under Second Skins”. 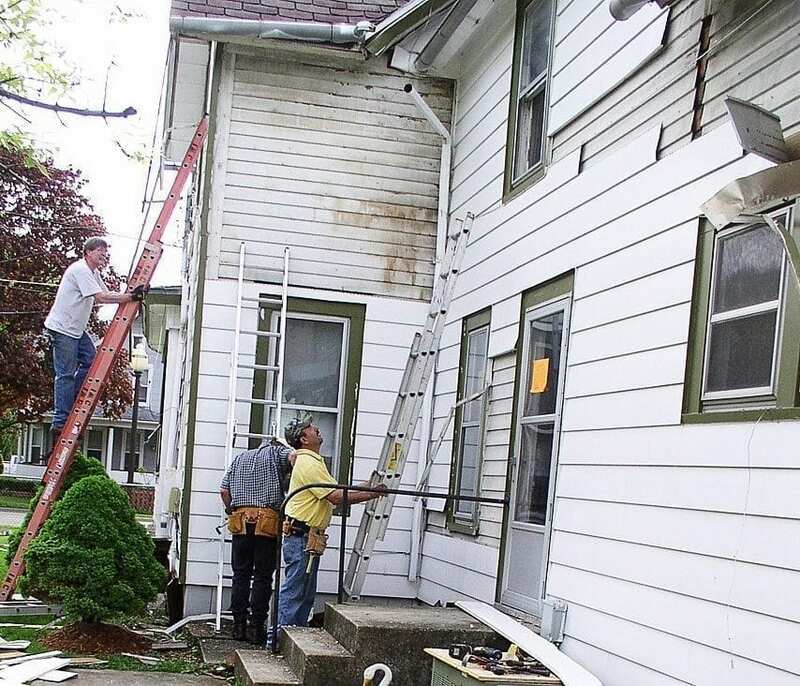 Here is a great story about what a Chicago neighborhood did to encourage homeowners to improve their homes by removing aluminum and vinyl siding. Read about their recipe for a vinyl siding removal party. The Great Unveiling neighborhood gathering. Your house needs painting and it has only been 6 years! Well, there are a few things you need to consider. First you need to understand the various types of paint applied to your house over the years and how they work together. Here is a great article by John Leeke about peeling paint and what you can do . There are other reasons causing paint to peel. Peeling paint may be symptomatic of a house with too much moisture inside. As warm, moist indoor air passes through the interior walls and hits cold exterior walls, it condenses into water, causing the exterior paint to bubble and peel. 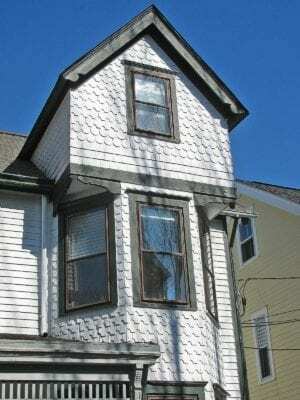 Slapping siding on a weeping house will trap moisture like a plastic bag. This will damage the old house by creating an ideal habitat for wood destroying insects, and cause the material underneath to decay. Over time, this problem can become very serious. It’s like putting a hat on a headache – it just doesn’t fix the problem. Eliminating the major sources of moisture may be all that’s needed to fix the problem: ventilate kitchens and bathrooms with exhaust fans, vent crawl spaces, etc. Vinyl Siding is NOT maintenance free. If you know someone who has had siding for several years, they may confirm that this substitute siding is not what the advertisers claim. Aluminum siding dents, scratches and tears. Vinyl is not much better. Like any plastic, it shatters when struck by something such as a baseball. Like all plastic, it expands and contracts. If it is nailed tightly enough to hold through the winter, it may expand in distorted, wavy shapes when heated in the summer sun. Once vinyl takes on new, unexpected shapes, it tends to stay that way. Imagine a vinyl record that warps when left out in the hot sun. 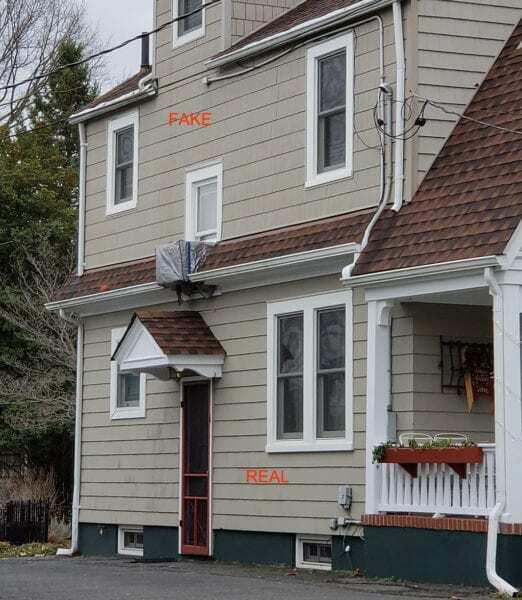 No one likes to paint their house. 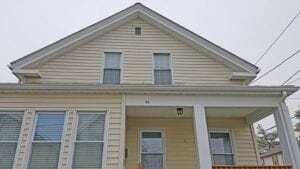 It’s expensive and bothersome, and vinyl siding seems like a great alternative. Even though vinyl can indeed be colored throughout, it can still fade. Once it fades – despite the claims of paint manufactures who are marketing specially formulated paints for vinyl siding – it is very difficult to paint. And once the homeowner begins painting the vinyl, what has he really achieved besides destruction of the buildings character? These concerns make it clear that a regular painting schedule and maintenance of wood siding is far preferable to the plastic stuff. The cold, hard truth is that no material is maintenance free, but good preparation of wood prior to painting and a good primer, will extend the paint life span. There is a new primer out on the market. Mad Dog Primer is part of a new generation of primers on the market. I have tried it on two areas that are very exposed to the weather. It has been three years now and the wood looks good. Is Using Vinyl Siding Saving the Forest? Should We Feel Guilty for Using Wood? The hazards of lead paint are very real. Take precautions and be sure to clean up old paint chips, but do not let you house be covered in vinyl just to avoid lead hazards. The National Park Service – Department of Interior, provides a Technical Preservation Service. 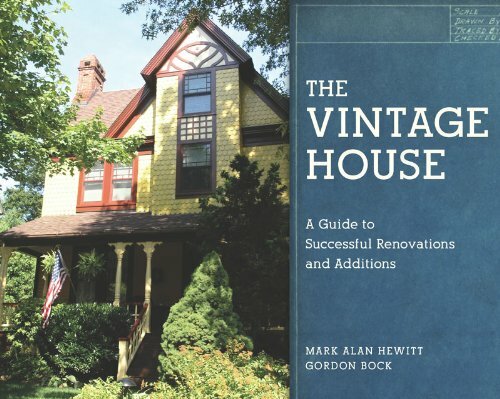 Writers working under contract with the federal government have assembled more than 40 booklets designed to help owners and developers of historic buildings recognize and resolve common preservation and repair problems. 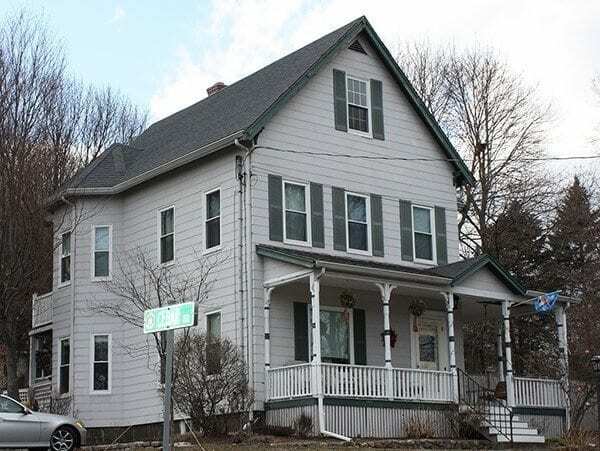 Preservation Bulletin #8 provides information on Substitute siding for old buildings, cost analysis, and energy efficiency. Homeowners Who Removed Their Vinyl Siding from their Homes. See their before and after photos and read their stories. We would love to include photos of your house too. 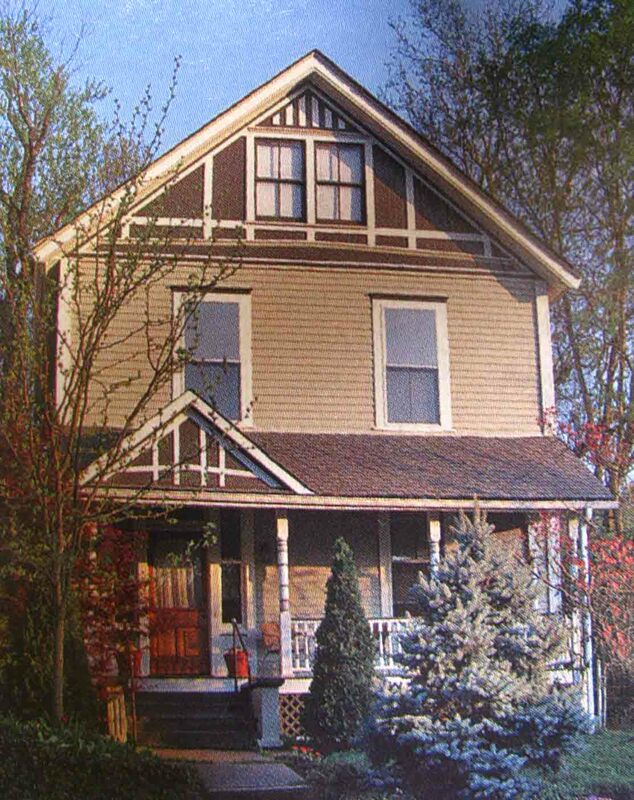 Dutch Colonial and large commercial building in Elgin IL. This isn’t a home – it’s a box. Thank you to Susan A from Rhode Island for improving her neighborhood. Congratulations to Mike G. from Mass. for uncovering his decorative shingles. Notice all the detail hidden under that vinyl siding. Frieze board under eaves, peeked window headers, transom window. Thanks to Brittany W. for sharing! Look what Kelly V. found under that asbestos. Wood was sanded and in perfect shape. Nice job!